Click HERE for new flyer & email registration info. REGISTER NOW! It will help the planners know how much food to bring. But come anyway, even if you are unable to pre-register. LATEST MESSAGE from Fall Retreat planners. Keep scrolling down for more info including driving directions. We hope this is coming to you as a reminder, and not as new information…and apologize to those of you receiving multiple copies. We hope to see you there, and also hope you will forward this email to your friends and contacts! We plan to explore the related and interwoven issues experienced by Native, immigrant, refugee, and unhoused communities, especially when viewed through a human rights lens. Please read on for more information, but first, if you plan to come to the Retreat but have not yet registered, please follow the instructions below to email your registration information to us as soon as possible! Thank you! EMAIL REGISTRATION: Please register for the Retreat by Email by November 16. If you cannot do so, please come anyway as you can also register at the Retreat! Email instructions: Send an email with your responses to the information items marked below with an asterisk ( * ) to Regon at runsoeld@gmail.com with FALL RETREAT in the Subject line. Thank you! YES! I / we will attend WWFOR’s Fall Retreat on SATURDAY NOVEMBER 17, 2018! Donation Note: An average donation of $20 should cover our costs. We invite people who can afford more to donate more, and invite others to donate less. If you cannot donate anything at all, we welcome you! Please make checks payable to “WWFOR” and earmark them “Fall Retreat.” Thank you! Lunch will be served, including vegan and gluten-free options. Thank you! We hope to see you at the retreat! From the north: Take I-5 to Exit 109. Turn right onto Martin Way, left onto College Street, left onto Lacey Boulevard, right onto Ruddell Road, left on 25th Ave SE, right on Hicks Lake Road SE, left on 30th Ave SE, right into Gwinwood and follow signs to the Westwood Conference Center. Free parking is in front of the building and beyond it. From the south: Take I-5 to Exit 108. Follow the long exit to College Street. Turn right onto College. Then follow the rest of the above directions. CARPOOLING saves gas and builds community. Network with others in your area! Unfortunately the Conference Center IS NOT on a bus line. Contact us at 360-701-5980 if you are unable to arrange a ride. 1. Deepen our understanding of the intersectionality of issues, values, and interests shared by Native, immigrant, refugee, and unhoused communities — and how this could influence our activism. 2. Deepen our understanding of how colonization, trauma, “otherizing,” resilience, and healing have shaped, and continue to shape, the struggles for human rights for Native, immigrant, refugee, and unhoused communities. 3. Explore ongoing ways for Retreat participants to network and collaborate in building bridges of respect, understanding, and solidarity with and among Native, immigrant, refugee, and unhoused communities. 1. The intersectionality of issues, values, and interests shared by Native, immigrant, refugee, and unhoused communities — and how this could influence our activism. 2. How colonization, trauma, “otherizing,” resilience, and healing have shaped, and continue to shape, the struggles for human rights for Native, immigrant, refugee, and unhoused communities. 3. An overview of community-based efforts to support our immigrant and refugee neighbors, including sanctuary. Group participants will include Strengthening Sanctuary and CIELO (Integral Educational Center for Latinos in Olympia). 4. 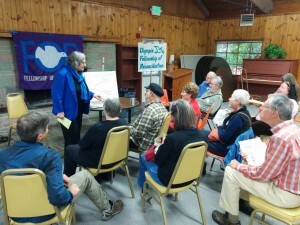 An overview of efforts in the Olympia area to amend or repeal anti-houseless city ordinances, and to provide direct support to unhoused neighbors living in the downtown and in wooded encampments. Group participants will include Just Housing, and possibly others. Your registration donation can help cover our costs. We welcome everyone regardless of ability to donate. We’ll break even if we average $20 per person. We invite people who can afford more to donate more and invite others to donate less. If you cannot donate anything at all, we welcome you! Please pre-register by Wed. Nov. 14 if possible to help us plan the day. But even if you can’t pre-register by Wed. Nov. 14, we want you to come anyway! You can register at the Retreat. The Fellowship of Reconciliation is a 100-year-old pacifist organization founded during World War I by activists determined to work together for peace and justice across national boundaries rather than let their governments cause them to see each other as enemies. The FOR and its members, here in the U.S. and across the globe, embrace the power of nonviolence as we resist war and struggle for human and civil rights; racial, economic, and climate justice; and native sovereignty. We have created a way of life over the past few hundred years that spews carbon dioxide, methane and other chemicals into the atmosphere and the waters of the planet. We have created nuclear weapons and nuclear power with unsolved issues beginning with the extraction of uranium from the earth leaving radioactive waste, to the development, production, and increasingly likely use of nuclear weapons. In considering the truth about the dire inter-relationship between these human created problems, we must not fall into the trap of despair. However, we must recognize the urgency and the need to act with bold and immediate remedies. Neither issue will be solved easily but the first step is to gather together to be informed, to discuss possible options and to make plans to create a better future for our children and our children’s children. You already know the basic information about the climate crisis and nuclear weapons, so instead of repeating that, WWFOR’s 2017 Fall Retreat will dig deeper. Our morning panel will share insights and affirm the urgency of taking strong, strategically smart actions now. Our afternoon work-shops will provide opportunities to connect and explore various ways to meaningfully work on solutions. A richly diverse group of people is planning this year’s program, and we hope to see you there! We are inspired by our theme, and we are a reflection of its commitment to working across racial and generational boundaries. We are committed to creating safe space within which we can have the courageous conversations necessary to create the more just, equitable, and sustainable world we all seek. 1. Privilege and oppression: developing awareness and understanding, and taking action. 2. Creating safe and welcoming schools by addressing issues of race, cultural heritage, and LGBTQ identity. 3. Building a diverse, interracial, and intergenerational coalition for racial, economic, and climate justice, and native sovereignty. 4. Intergenerational story-telling, relationship-building, and movement-building collaboration. 5. Exploring the power of social media in movement-building. Please join with us on Saturday November 12 for WWFOR’s 2016 Fall Retreat. We will provide coffee and tea, but no food. Bring your own lunch. No restaurants are nearby. Pre-registering early (preferably by Wednesday, November 9) will help us plan for a productive day! Location and directions to the old main lodge of Gwinwood Conference Center, 6015 30thAve SE in Lacey (SE of Olympia). From the north:Take I-5 to Exit 109. Turn right onto Martin Way, left onto College Street, left onto Lacey Boulevard, right onto Ruddell Road, lefton 25th Ave SE, right on Hicks Lake Road SE, left on 30th Ave SE, right into Gwinwood and see the old main lodge straight ahead. Free parking is in front of the building and beyond it. From the south:Take I-5 to Exit 108. Follow the long exit to College Street. Turn right onto College. Then follow the rest of the above directions. Practical Democracy: How Can We Make it Work for All of Us? View the 2015 Fall Retreat flyer and pre-registration form. Our economy has been hijacked by the 1% — and even the 1% of the 1% — forcing the rest of us to suffer with lower incomes and austerity cutbacks in basic services. The public wants peace, but the military-industrial complex and “national-security state” launch endless wars. The public wants food that is safe and healthful, energy that is clean and renewable, and health care that is affordable and available, but instead giant corporations – and the politicians they fund and lobby – give us the opposite. This anti-democratic pattern repeats itself in all sectors: Fossil fuel companies worsen the climate crisis; the gun lobby prevents laws to reduce gun violence; real estate developers causes local governments to continue suburban sprawl, profit-making companies privatize schools and lay off teachers, giant corporations consolidate ownership of news media to become monopolies and lock out alternative voices, political parties pass laws and gerrymander districts to promote their own candidates and reduce minority voting, and the list goes on. Many of our federal, state and local governments are run by people who are grossly ignorant, mean-spirited and corrupt. The American people deeply value the principle of democracy, but nationally and locally, rich and powerful entities have corrupted the government to serve their narrow interests instead of the broad public interest. Some of the anti-democratic behaviors above have antagonized – or prevented – voting to such an extent that the U.S. has the lowest voting turnout of any traditionally democratic nation. But elections are only a little part of what democracy means. Practical democracy would empower ordinary people – not limited to those eligible to vote – to equip themselves with accurate information, and it would empower them to wield actual power all year around, not just on certain election days. It would do this not only for electing government officials, but also for making substantive decisions in all sectors (economics, energy, environment, media, policing, social justice issues, governmental accountability, etc.). Practical democracy would make the principle of democracy come to life in every aspect of our daily lives! Big political parties and the extremely rich persons and businesses that fund them try to distract us from the real issues and narrow our focus to mere electioneering. We must broaden and deepen our vision to applying democracy’s principles in practical ways to help our people and our planet. Please join with us on Saturday November 7 for the Western Washington Fellowship of Reconciliation’s 2015 Fall Retreat. We will enjoy an inspiring and practical keynote by Mary Lou Finley, who has decades of experience with grassroots movements for social and political change. Together, we’ll make progress toward practical democracy. At 9:00 am the WWFOR Fall Retreat will welcome people with light refreshments and social time. We’ll begin in earnest at 10:00 am and continue (with your own brownbag lunch) until 5:00 pm. We’ll offer light refreshments continually throughout the day. We suggest a $15 donation to help cover costs. Pre-registration helps us better plan the day, so if possible, please pre-register by Wed. Nov. 4. Even if you can’t pre-register by Wed. Nov. 4, please come anyway! To Pre-Register: Download the form using the link at the top of the page. Directions to the Gwinwood Conference Center (the old main lodge) in Lacey, near Olympia. From the north: Take I-5 to Exit 109. Turn right onto Martin Way, left onto College Street, left onto Lacey Boulevard, right onto Ruddell Road, left on 25th Ave SE, right on Hicks Lake Road SE, left on 30th Ave SE, right into Gwinwood and see the old main lodge straight ahead. Parking is in front of the building and beyond it. From the south: Take I-5 to Exit 108. Follow the long exit to College Street. Turn right onto College. Follow the rest of the above directions. Cost: We keep costs low and try to just barely break even. We can cover our costs if we average $15 per person. We give discounts to young and low-income people upon request. Persons who can afford to give more will help offset the cost for those who have less. One way to keep the cost low is to ask each person to PLEASE BRING YOUR OWN LUNCH. We provide coffee, tea, and light refreshments throughout the day. Note: the information below is from 2014’s event. Most Americans are suffering from economic injustice in one or more ways. Many millions can’t find decent jobs or work for wages that are too low. The gap between extremely rich people and everyone else has been widening since the 1970s. Many Americans are homeless or are suffering from foreclosure. The Occupy Movement and millions of Americans’ ongoing experiences have convinced more and more people that capitalism is failing to meet most people’s needs, so they are looking for alternatives. 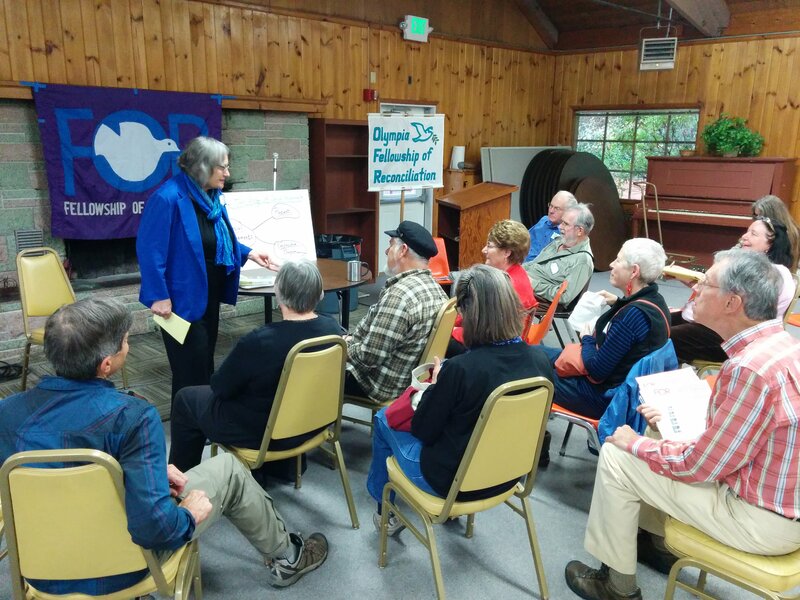 Western Washington FOR’s 2014 Fall Retreat – “Economic Justice for the 99%” – will bring us together to better understand the problems and to work together at the grassroots to organize solutions. Everyone is invited to WWFOR’s 2014 Fall Retreat in a pleasant setting in Lacey, near Olympia. Our annual Fall retreat on Saturday November 8 will bring people together from throughout our region to stimulate grassroots progress toward economic justice. We are planning a keynote, workshops, and small groups to share information and work on solutions, especially after we return home that evening. View the 2014 Fall Retreat flyer. Check back here for updates or contact Glen Anderson at (360) 491-9093 or glen@olympiafor.org. At 9:00 a.m. we will welcome people with light refreshments and social time. We’ll begin in earnest at 10:00 a.m. and continue (with your own brownbag lunch) until 5:00 p.m. The Fall Retreat will occur in the rustic Old Main Lodge at the Gwinwood Conference Center in Lacey. The WWFOR Fall Retreat is held at the Gwinwood Conference Center (the old main lodge) in Lacey, near Olympia. From the north, take I-5 to Exit 109. Turn right onto Martin Way, left onto College Street, left onto Lacey Boulevard, right onto Ruddell Road, left on 25th Ave SE, right on Hicks Lake Road SE, left on 30th Ave SE, right into Gwinwood and see the Old Main Lodge straight ahead when you first enter the conference center. Parking is in front of the building and beyond it. From the south, take I-5 to Exit 108. Follow the very long exit to College Street. Turn right onto College and follow the rest of the above directions. Cost: We keep costs low and try to just barely break even. $15 per person will cover our costs. We give discounts to young and low-income people upon request. Persons who can afford to give more will help offset the cost for those who have less. Part of keeping the cost low is for you to BRING YOUR OWN LUNCH. We will provide coffee, tea, and light refreshments throughout the day. Mary and our other presenters offered workshops that allowed participants to learn more and explore future actions. We hope that the follow up from the retreat will reinvigorate FOR members to connect racial and economic justice to issues of militarism and to work with our allies on these issues. The original Jim Crow laws were racially motivated state and local laws in the United States enacted between 1876 and 1965. Examples of those Jim Crow laws were the racial segregation of public schools, public transportation, the U.S. military and of public places, such as restrooms, restaurants, and drinking fountains. The New Jim Crow is a name given to a category of more recent race-related social, political, and legal phenomena in the U.S. Interconnected issues include the school-to-prison pipeline, economic disparity, voter suppression, immigration, racial profiling, juvenile justice, and the so-called war on drugs. How can we be effective allies with others seeking justice? What can I do in my daily life that will make a difference? Should we plan a larger regional conference concerning the police and racial justice? Why and How do we move (or not move) to action? What motivates us? “In my view, the most important lesson we can learn from Dr. King is not what he said at the March in Washington, but what he said and did after. In the years that followed, he did not play politics to see what crumbs a fundamentally corrupt system might toss to the beggars of justice. Instead he connected the dots and committed himself to building a movement that would shake the foundations of our economic and social order, so that the dreams that he preached in 1963 might one day be a reality for all.